Almost every film, from the classic to the guilty pleasure, contains blunders that can be so blatant, one wonders how filmmakers ever missed them. In this second all-new volume in the Oops! series, readers will discover hundreds more bloopers from Bringing Up Baby (1938) to the Oscar-winning Crouching Tiger, Hidden Dragon (2000). Each entry lists title, credits, plots, non-bloopers, oddities, fun facts, and, of course, bloopers, each described and keyed to the on timer a video player for easy locating. Almost every film contains blunders and gaffes that can be so blatant, one wonders how the filmmakers ever missed them. 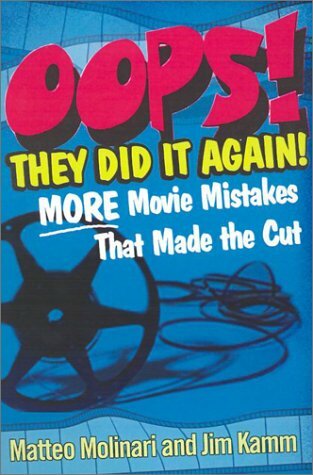 Authors Molinari and Kamm have obsessively catalogued, sorted, scrutinised and 100 percent verified the biggest blockbuster gaffes ever unreeled before our eyes. In this second all-new volume in the Oops! series, they actually deliver what most sequels only promise - absolutely new material! Readers will discover hundreds more bloopers from Bringing Up Baby, to Oscar-winning Crouching Tiger, Hidden Dragon. Each entry lists title, credits, plot, bloopers, questions and fun facts. Bloopers range from the hilariously obvious to the barely perceptible - each keyed to the timer on a video player for easy locating.